Posted June 30, 2018, 10:19 a.m.
Robert Garcia, a young father of two, finished his last shift as a tow truck driver shortly before midnight June 28, 2012. He parked his truck and was walking to the office to turn in his keys when two youths and a boy came after him with a gun. The final seconds of the drama were captured by surveillance cameras outside the employee entrance to Vernola's Towing Service at 13514 Norwalk Blvd. in Norwalk. In the video, Garcia jogs jerkily to the locked door and knocks to get inside, while the gunman and two other males run away, one of whom looks no more than 9 or 10 years old, said Los Angeles County Sheriff's Det. Ralph Hernandez. "He's wearing light clothing, and you can see he's a little boy, just by his mannerisms and goofy gait," Hernandez said in an interview Friday. "He looks like a little kid who was tagging along with some older friends or an older brother." Investigators hope this detail will help solve the case, that "someone will remember a guy who used to roll with his little brother, or a little kid tagging along in the car," Hernandez said. VIDEO: Robert Garcia was shot and killed as the ended his shift at “Vernola’s Tow” in the city of #Norwalk. There aren't many other clues to go on, Hernandez said. Garcia was shot multiple times in the back and chest, according to coroner's records. A co-worker called 911, but Garcia was pronounced dead at the scene at 12:26 a.m. June 29. The three attackers all appear to be Latino, Hernandez said, and the two older males appear to be in their late teens or early 20s, no older than Garcia, 22. The three fled in a black sedan. Investigators thought someone may have shot Garcia out of retribution for repossessing a vehicle, Hernandez said, but detectives couldn't find any obvious cases in the towing company's logs. "It could have been a random robbery, and he was a victim of opportunity, or a random confrontation, with them mistaking him for a gang member," Hernandez said. "We just don't know the motive right now." On Thursday, the department announced a $10,000 reward for information leading to the arrest and conviction of Garcia's killers. The reward was approved by the Los Angeles County Board of Supervisors and sponsored by Supervisor Janice Hahn. A group of Garcia's family and friends attended Thursday's news conference wearing bright yellow or black shirts imprinted with photos of Garcia. One held a large sign with hearts and words that read simply: "Justice for Robert Garcia." "He was a very loving, family-oriented person," said his mother, Anna Salazar. "Everything he did revolved around his family, his children and his friends." The victim's father, Lloyd Garcia, remembered his son as a "good boy," and like Salazar, asked for help in finding the gunmen and giving his family some closure. Salazar said about 40 friends and family members were planning to gather at Norwalk Square to pass out flyers about the case. The family has done this twice a year since Garcia died, she said, in hope of finding someone with information about the shooting. Her son was living in Norwalk with his fiancée and their two children, a 3-year-old daughter and a 3-month-old son. Six years later, Salazar said, his children are struggling to understand why they don't have a father. "His son doesn't understand what death is really yet. He's just 6, about to start kindergarten, and he's going through some stuff," she said. "And my granddaughter is struggling day by day, trying to figure out why her dad is gone. She was very close to Robert; there wasn't a day he missed being with his daughter." Garcia grew up in Whittier and attended Pioneer High School, but he had been living in Norwalk with his fiancée's family before he died. Their goal was to get a home of their own, Salazar said. Garcia had just completed classes to become a security guard. His certificate and card arrived in the mail a couple of days after his death. "He was trying to get his life together for his family before he was killed. He didn't have any enemies, and he dedicated his life to providing for his family," Salazar said. "That's what blows our minds every day — the what, who and why. What could he have done to deserve this, who did it and why?" 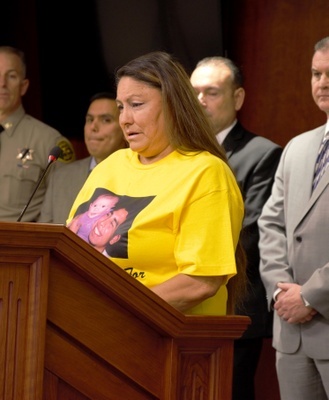 Photo: Anna Salazar, wearing a shirt bearing the face of her slain son, Robert Garcia, and his daughter, asks for help Thursday during a news conference announcing a reward for information about the fatal shooting in Norwalk on June 28, 2012.